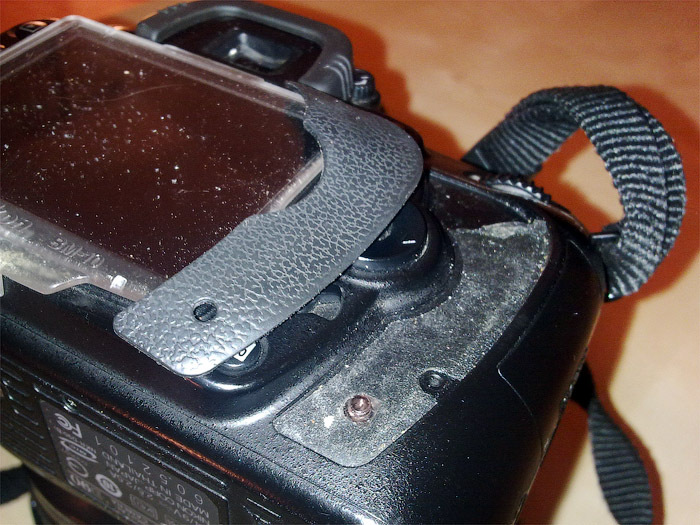 What do you call this gum part on the back side of the camera body where you hold your thumb at? My camera is a 5-year-old Nikon D90 and I have used it in many extreme situations without taking care after the body much. After the recent mountain trip, the glue which used to bond the gum part to the body has dissolved under heat or dust or both, and the gum part keeps falling off the camera. The gum has also extended due to temperature fluctuations and the part does not fit into the old place any more. I cannot hold the camera comfortably. The conclusion is: I need a replacement for the gum part. I can't explain my problem clearly because I do not know the name of the part in question. What is it called? Has anyone had a similar problem? Are these parts for sale from Nikon? Not the answer you're looking for? Browse other questions tagged nikon nikon-d90 body or ask your own question. Should I upgrade my D40 to a D5100, D90, or D7000? Why is exposure meter reading not changing in Manual mode? How do I separate a stuck Nikon 400mm f/2.8 AF-S (non-VR) lens from a D800E body? How to prevent a child from accidentally deleting photos during playback?